Lucky are those with emerald eyes for playing with makeup for green eyes is a rare kind of fun. For those who were blessed with them, this list is for you. I took the liberty to list eye makeup for green eyes from Kathleen Lights because she has beautiful green eyes and although on the color wheel, purples and deep reds complement green better, you’ll see how green eyes really can be played up with a lot of different eyeshadow colors. 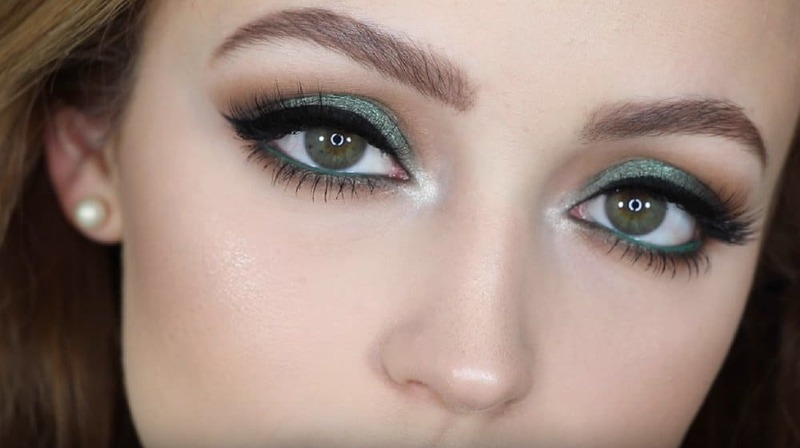 So if you’re ready here are some of Kathleen Lights’ eye makeup look that goes really well with her green eyes. This beautifully dark glittery blue color is a really good eye makeup for green eyes. Not only does it frame the eye with a deep rich color but it also makes the eyes pop. Red and orange eyeshadow colors on green eyes is a good way to make the greens of the eye stand out, because of the contrasting hues, both the eye color and the eyeshadow are highlighted. This orange eyeliner look by Kathleen Lights is an ingenious way to feature the eyes. The use of orange, which is a contrasting color to green, makes this a makeup look for green eyes. And because this look is totally spring-ready, I can’t help but remember those cute spring nails I saw the other day. I love purple on green eyes because it brings out the deep tones of green and at the same time makes the eye makeup stand out. This take on purple makeup for green eyes is not only beautiful, it’s fresh! How nice would this be if paired with dainty nail art? We need to try this out, ladies. A deeper purple, this time; this look really makes Kathleen Lights’ green eyes light up. Do you notice that her green eyes look more pronounced with a purple-toned eyeshadow color? I really love how dainty this looks as well with the gold pigment placed at the center. Another really good contrast to green eyes are reddish hued colors, so this brown red number by Kathleen Lights easily takes the cake for beautiful eye makeup for green eyes. Honestly, because her eyes are a warmer shade of green – nearing hazel, the warm tones in this warm, red color really brings out the warmth in her eye. You might think that a green eyeshadow color might not be the best for makeup scheme green eyes, but if you use a different hue, a monochromatic look is always hot. I can’t help but think this look is definitely spring-makeup worthy and I can’t wait to pair it with a playful spring dress! Green eyes are really beautiful and it’s such a waste not to be able to play with makeup on them so don’t be afraid to experiment and to try out other different colors that you might fancy, all that matters is that you feel comfortable wearing makeup for green eyes. What do you think is the best eye makeup for green eyes in this list? Let us know in the comments section below, and if you think we only have makeup tips for green eyes, we have more for blue-eyed ladies. Follow us on Facebook, Twitter, Instagram, and Pinterest for the latest makeup, hair and nail trends! *Editor’s Note – This post was originally published in June 2017, and has been updated for quality and relevancy.